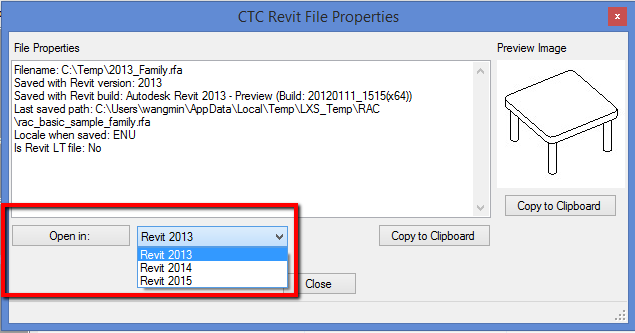 The free Revit Properties tool in CTC’s BIM Project Suite modifies the Windows Explorer / File Explorer interface to quickly provide access to basic data about Revit files by simply right-clicking on them and selecting the “Revit Properties” choice from the Explorer pop-up menu. Revit Properties will show you information about the Revit file, including the version of Revit last used to save the file, and also things like worksharing information. With the latest release, included with BIM Project Suite 5.1.8, you can use Revit Properties to open a Revit file with a specific version of Revit. Only versions of Revit that are installed and are the same or later versions of Revit that last saved the file will be in the list of choices. Revit Properties will let you “Create New Local” from a central file in the same manner that Revit does, however it cannot open a project “Detached from central” nor can it allow you to choose which worksets to open, or to open the file with auditing turned on. There's more information available on the CTC website. Thanks to CTC's Scott Z. for the update!